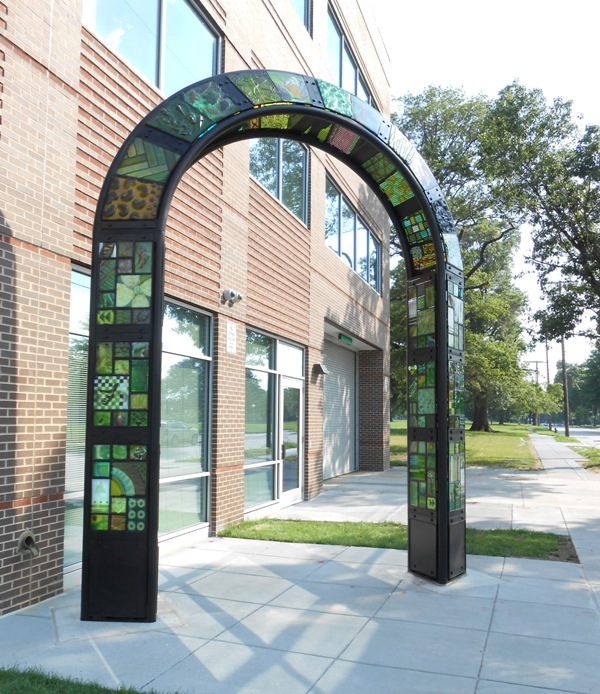 The Washington Glass Studio was awarded the commission to create the new landmark artwork sculpture for the Laurel Library (now under construction next to Emancipation Park in Laurel, MD). 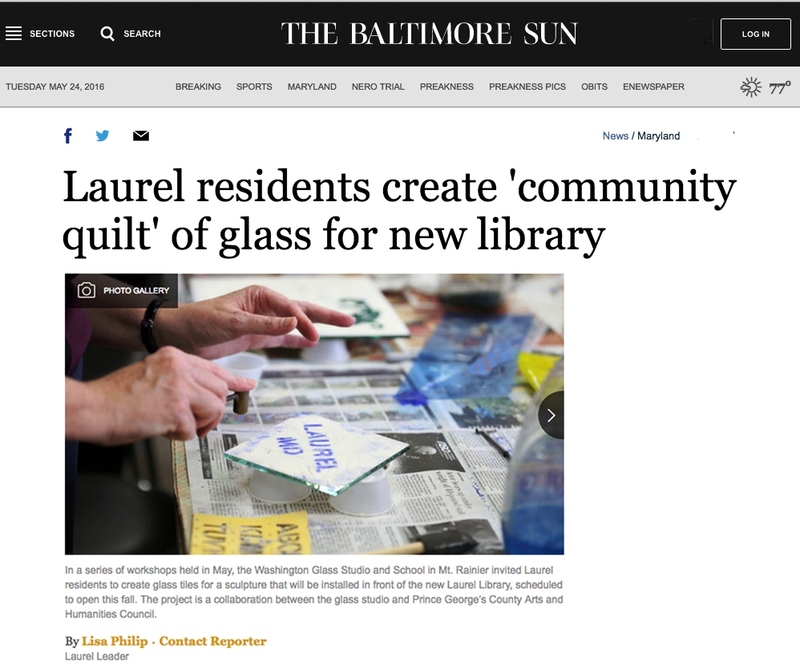 Baltimore Sun reporter Lisa Philip visited the Washington Glass Studio last week as the Library area residents and interested citizens collaborated in glass-making workshops to make the inset panels . 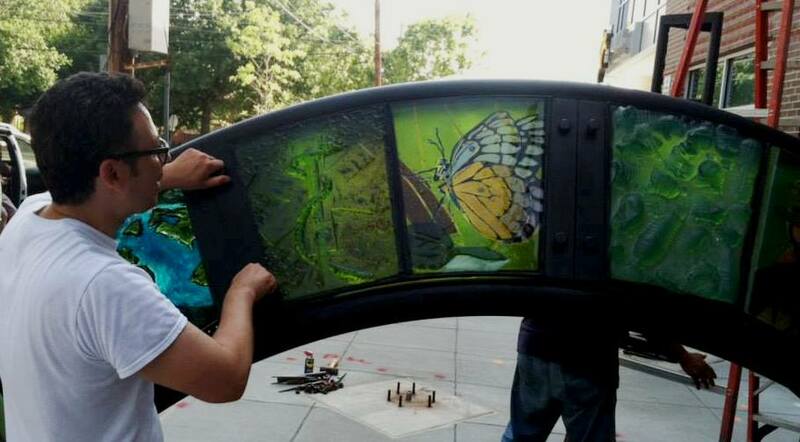 Click HERE to jump to Lisa Philip’s article on how the artwork is engaging the community. 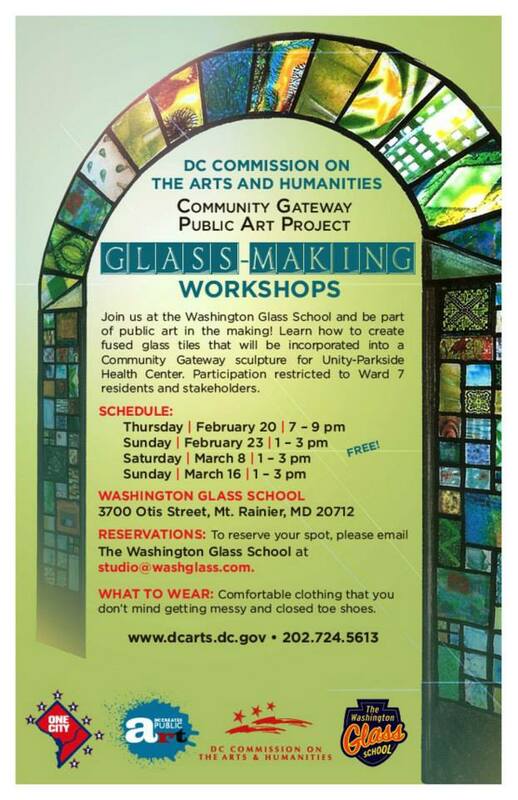 Baltimore Sun coverage of how the Washington Glass Studio engages community. 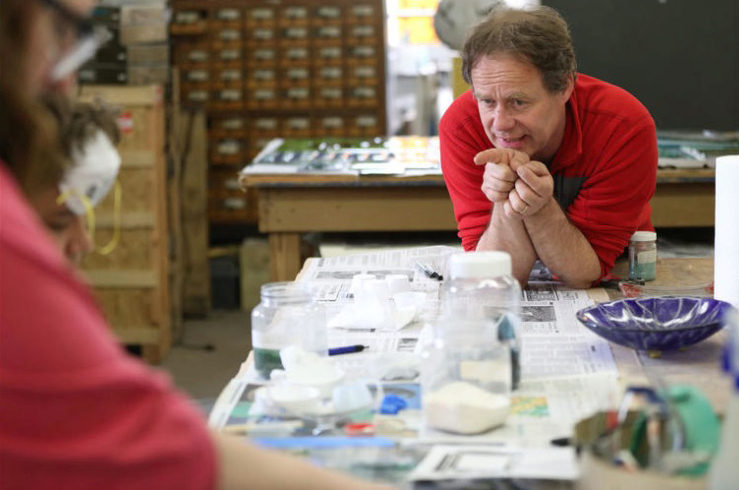 Erwin Timmers, co-founder and -director of Washington Glass Studio, advises a Laurel resident on his creation of a glass tile for the public art sculpture that will stand in front of the new Laurel Library, set to open this fall. 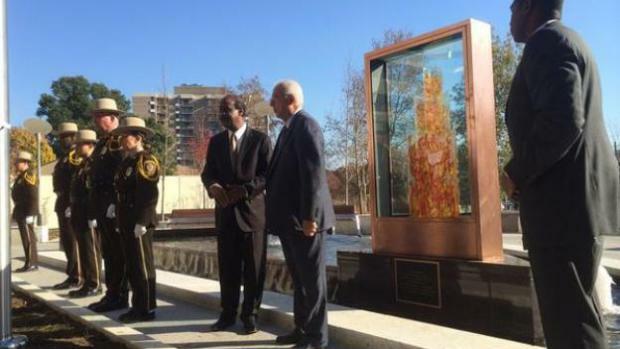 Montgomery County officials dedicated a new plaza and eternal flame in honor of the county’s war veterans on Monday, just before the next day’s observance of Veterans Day. 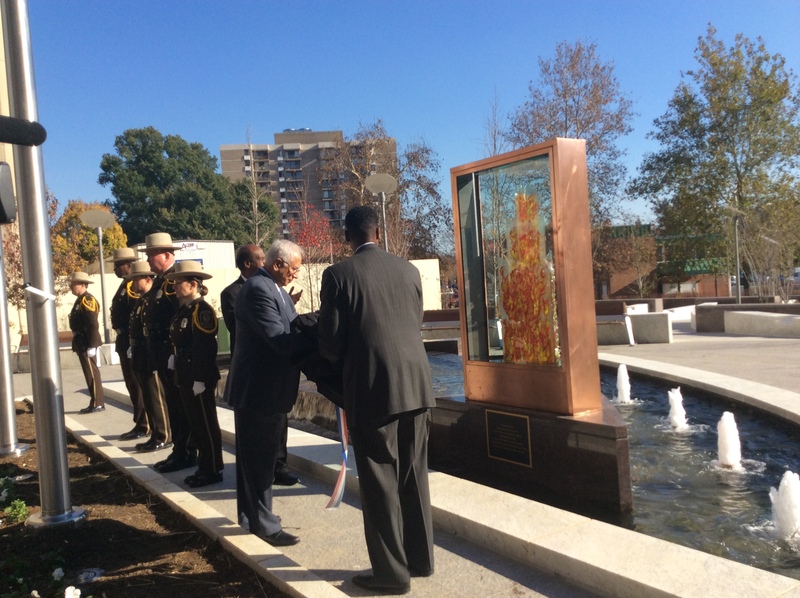 County Executive Ike Leggett and Council president Craig Rice dedicated the plaza and its Fallen Heroes Memorial, which is part of the Judicial Center Annex construction project. 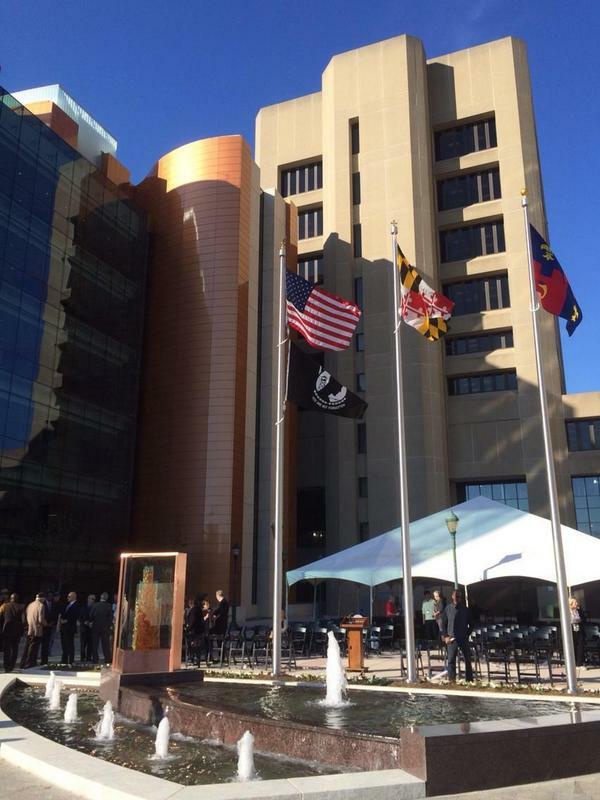 The plaza is part of the Judicial Center Annex construction project that began in 2011 and involved an addition and renovation of the existing Judicial Center. 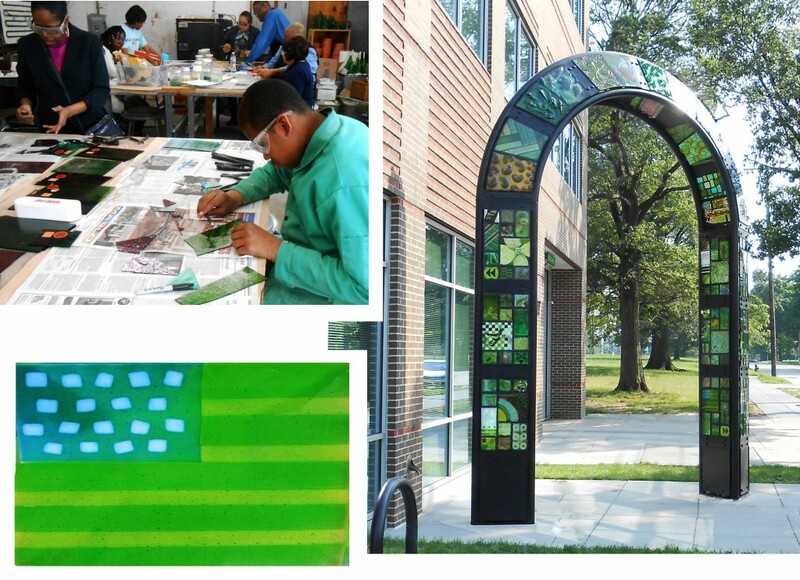 The plaza and green spaces were redesigned to invite public use of the space. 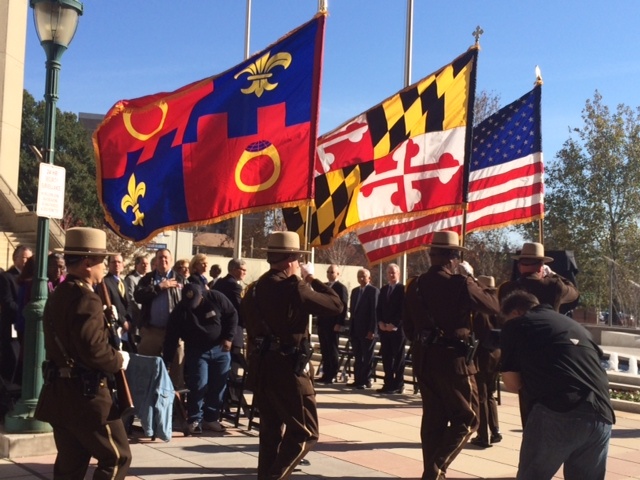 During remarks at the dedication ceremony, County Council President Craig Rice, the son of a Vietnam veteran, noted the importance of having a peaceful place to visit to reflect and remember the sacrifices of our veterans.Among those participating was retired Navy Cmdr. 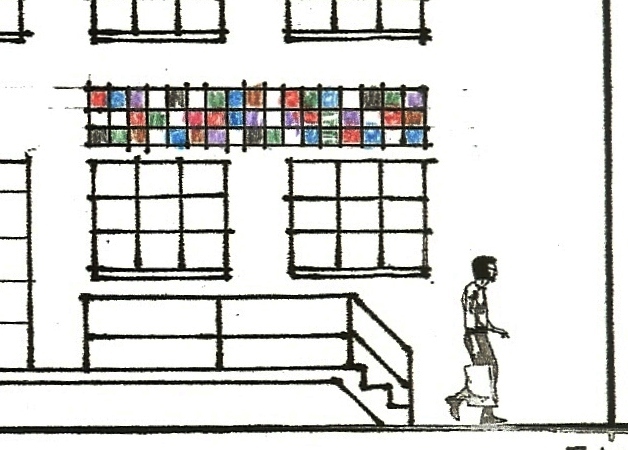 Everrett Alvarez Jr. of Potomac, who was the longest-held prisoner of war in Vietnam. 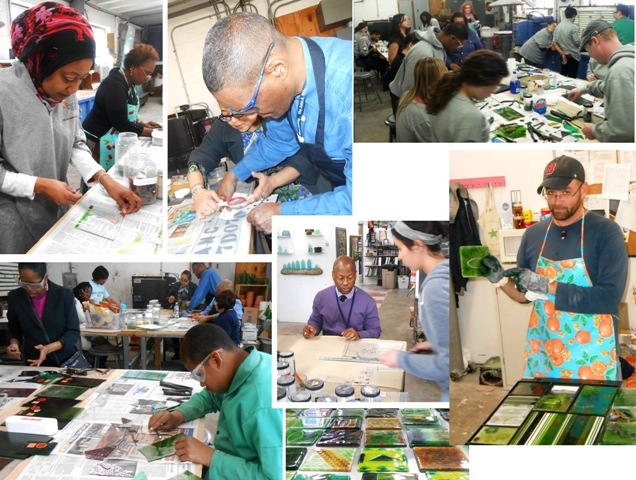 Above grid includes work from top, L to R: Allegra Marquart, Jennifer Lindstrom, Jackie Greeves, Robert Kincheloe, Evan Morgan, Dave Cook. 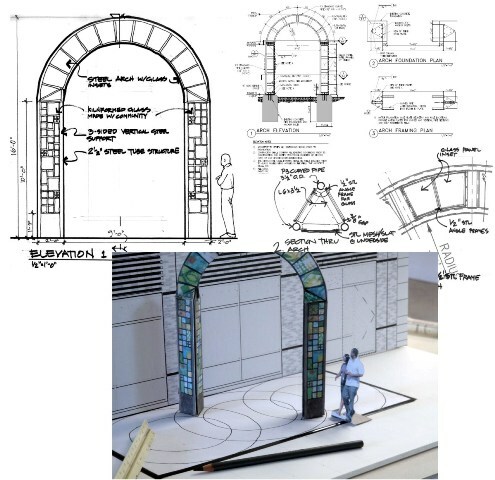 As mentioned in a posting earlier this year, the Washington Glass School’s will be celebrating its 10th Anniversary with the creation of a collaborative artwork that will be mounted on the front facade of the glass school. 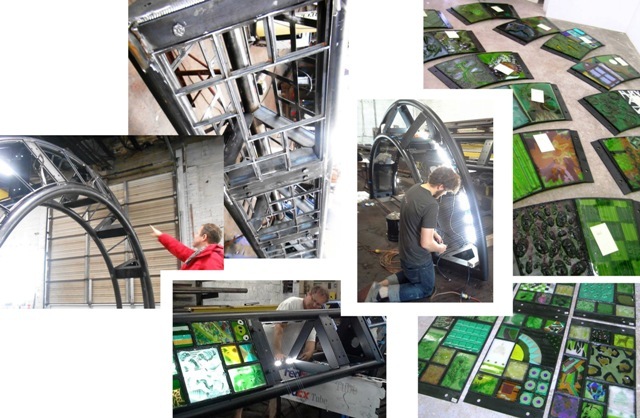 WGS Director Tim Tate organizes and sets out the artwork tiles into the steel grid framework. 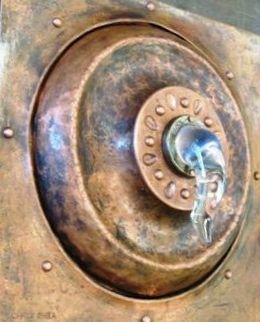 Copper & glass panel is collaboration between metalsmith Chris Shea and glass artist Don Daniels. 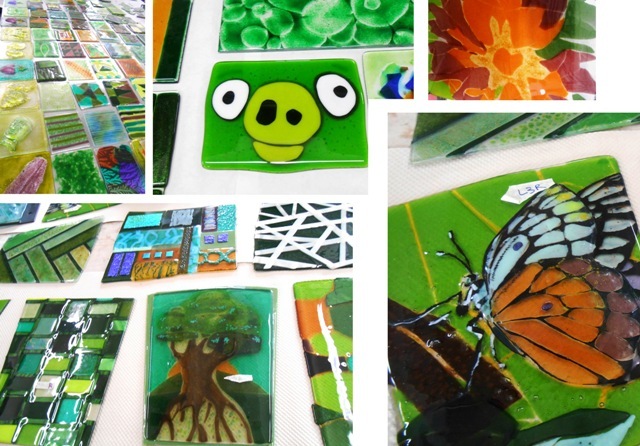 Glass panels made by filmmakers Jon Gann and Kerri Sheehan. 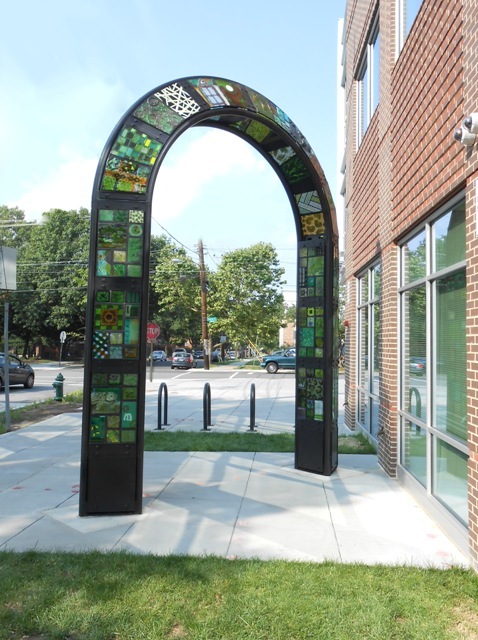 Installation of the glass panels will take place in the next week or so (certainly after the Hurricane Irene is has passed). 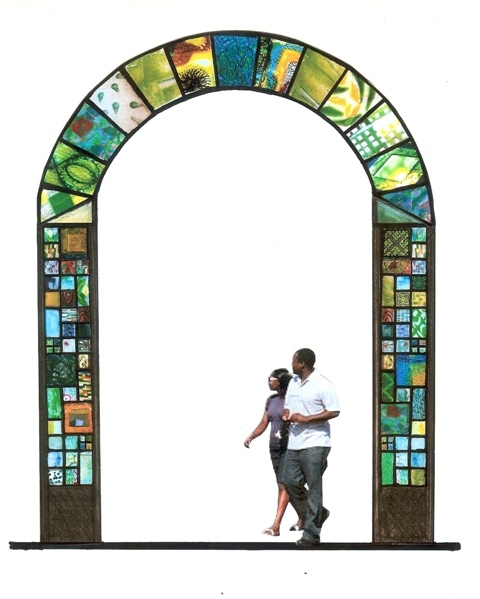 Proposed artwork location at the front of the glass school. 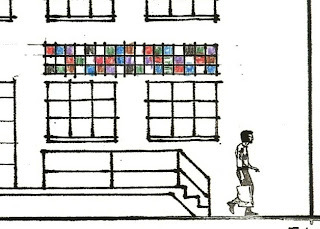 The author of this article is depicted as leaving the studio.